The commercial cargo delivery flight departed Cape Canaveral with a roar from the Falcon 9’s Merlin 1D main engines, producing 1.7 million pounds of thrust to dispatch the 213-foot-tall (65-meter) rocket toward the northeast over the Atlantic Ocean. The Falcon 9’s on-board guidance computer pivoted the rocket on a trajectory to align with the space station’s orbital track, and the slender kerosene-fueled launcher climbed through wispy high-level clouds, broke the sound barrier, and arced away from Florida’s Space Coast trailing a flickering tongue of orange exhaust. Nine minutes later, the Falcon 9’s upper stage delivered the Dragon supply ship into orbit, followed by deployment of the SpaceX-owned cargo capsule. The Dragon spacecraft extended its solar arrays to begin generating electricity a few minutes later. “Dragon is in a good orbit, solar arrays have deployed, and the propulsion system is operating nominally,” said Jessica Jensen, director of Dragon mission management at SpaceX. The robotic supply ship will fine-tune its approach to the space station Tuesday, setting up for a laser-guided rendezvous Wednesday that will culminate in the Dragon’s capture by the lab’s Canadian-built robotic arm around 7 a.m. EDT (1100 GMT). 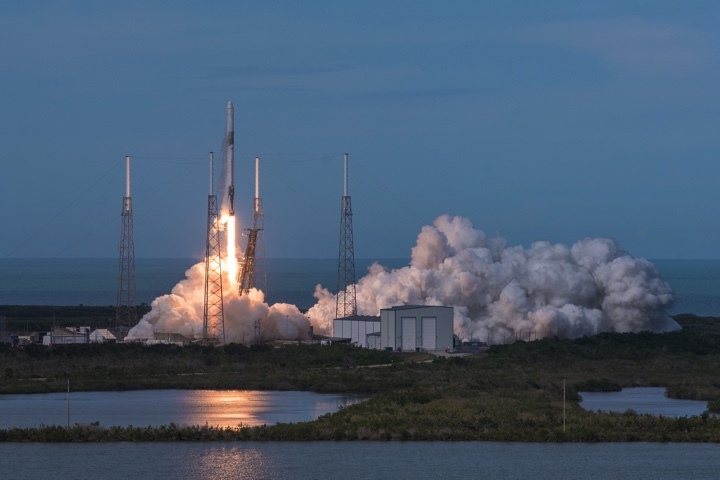 The supply haul is the 14th cargo mission to the space station launched by SpaceX under a contract with NASA valued at more than $2 billion, covering 20 logistics deliveries through 2019. SpaceX also has a follow-on contract, along with competitors Orbital ATK and Sierra Nevada Corp., for additional resupply missions through 2024. Monday’s launch was the second time SpaceX has flown a reused rocket booster and a reused cargo capsule on the same mission. In sum, SpaceX has launched previously-flown Falcon 9 rocket stages 11 times, all successfully, including two modified boosters on the maiden flight of the company Falcon Heavy rocket. And all of SpaceX’s upcoming resupply missions to the space station, at least for this year and 2019, will employ reused Dragon capsules plucked from the sea and refurbished for future flights. “What’s really neat about this is it’s becoming the norm,” Jensen said in a pre-launch press conference. “And we like that. The first stage of the Falcon 9 rocket launched Monday first flew in August 2017 on SpaceX’s 12th space station resupply mission, then returned to a landing at Cape Canaveral a few minutes later. The Dragon capsule made a round-trip journey to the space station and back to Earth in April and May of 2016, and the craft was the first to debut improved sealing to prevent sea water from infiltrating critical internal components after splashdown in the Pacific Ocean. SpaceX did not try to land the first stage on Monday’s mission, electing to use the rocket for experimental maneuvers downrange from Cape Canaveral over the Atlantic Ocean. 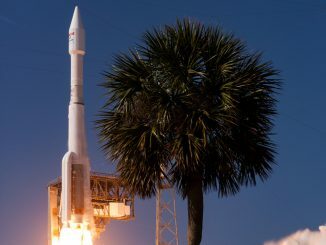 “We are looking forward to reuse in the long term, and it’s always good for us if we can get data that is sort of pushing the bounds,” Jensen said before the launch. “In this case, we have a booster that has already flown. We were looking at the service lifetime of that and trading should we bring it back to land or the drone ship, or should we do a demonstration mission. 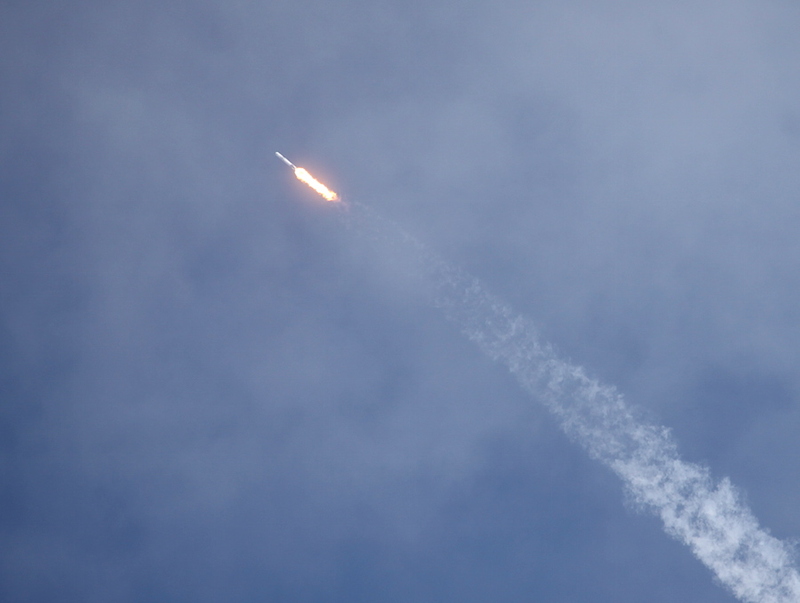 The rocket was expected to make a hard splashdown in the Atlantic Ocean, Jensen said. 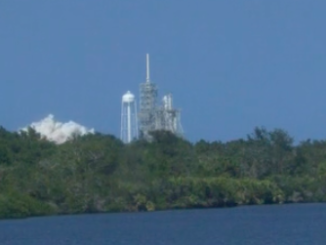 Monday’s blastoff was the second by a Falcon 9 rocket in three days. A Falcon 9 rocket, also powered by a previously-flown first stage booster, launched Friday from Vandenberg Air Force Base, California, with 10 commercial Iridium communications satellites. The quick turnarounds from coast-to-coast are nothing new for SpaceX, which conducted Falcon 9 flights from Cape Canaveral and Vandenberg as close as two days apart last year. SpaceX’s next rocket launch is scheduled for April 16, when a newly-manufactured booster will hurl NASA’s Transiting Exoplanet Survey Satellite into an orbit that eventually will each the beyond the moon. The science probe will try to find planets orbiting bright, relatively nearby stars, worlds that might be ripe for follow-up by bigger observatories like the James Webb Space Telescope. Engineers at SpaceX’s headquarters at Hawthorne, California, will keep busy in the coming days with the Dragon mission. After its arrival at the space station Wednesday, the Dragon will be maneuvered to a parking port on the Harmony module for a month-long stay. Astronauts will open hatches leading to the cargo freighter, then begin unpacking the approximately 3,794 pounds (1,721 kilograms) of equipment and provisions inside Dragon’s pressurized compartment. 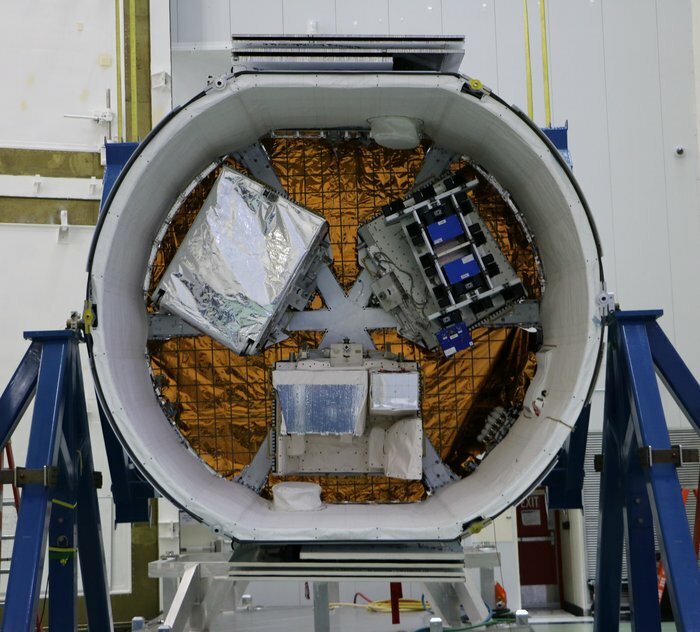 Cargo loaded inside Dragon’s internal cabin includes food, clothing, care packages, and more than a ton supplies related to scientific investigations. There is also an experiment in sintering that could help engineers fabricate or repair tools and spacecraft components on future missions. New high-definition cameras and a custom HP printer for station astronauts also launched inside the Dragon capsule Monday. While astronauts transfer cargo delivered inside the Dragon module, mission control will command the station’s robotic arm to pull three payload packages out of the spaceship’s unpressurized trunk section. One of the payloads is the Atmosphere-Space Interactions Monitor, or ASIM, an instrument funded by the European Space Agency and led by Danish scientists to study lightning from the space station. The Dragon spacecraft is scheduled to remain at the space station until May 2, when the robotic arm will detach the capsule and release it for a re-entry back into Earth’s atmosphere. Parachutes will slow the ship’s descent into the Pacific Ocean, where SpaceX recovery crews will stand by to retrieve Dragon and its contents. The Dragon spacecraft will return to Earth with more than 4,000 pounds of equipment and experiment specimens, including a humanoid robot named Robonaut that has been on the space station since 2011. Engineers want to bring Robonaut back home for repairs. Developed as a testbed to see whether robots could help astronauts clean and maintain the space station, Robonaut launched aboard the final flight of the space shuttle Discovery in 2011. A SpaceX Dragon cargo capsule delivered legs for Robonaut in 2014.